I’ve sat down a few times to write this particular blog. My goal is to encourage fellow Paralegal Division members to submit a nomination to become a council member. However, every time I’ve started to write this blog post, the first two sentences have always sounded like a business pitch and felt very impersonal. To me, being a part of the council is very personal. We represent a diverse group of paralegals across North Carolina from as far west as Franklin to as far east as New Bern and Wilmington. We work in small firms, large firms, government and in-house positions. Serving as a council members provides you with opportunities to grow professionally, meet new friends, and experience the value of networking. I’m very proud to be chair, and I hope sharing my experience will encourage others to apply. The Paralegal Division is accepting nominations for new division council members through Feb. 28. Click here to find the nomination form. My road to becoming chair started the minute I decided to submit my nomination for a council member position. 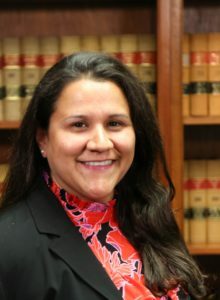 I started working as a paralegal toward the end of 2004 and graduated from the Duke Paralegal Program in February 2005. I spent two years working at a medium size firm in Raleigh. By 2012, I was firmly established as an in-house paralegal. While I love being in-house, it can also be very lonely or isolating. You don’t have the day to day contact with paralegals like in a firm setting. And figuring out how to make those connection again can be overwhelming. I was fortunate to have (and still have) a good friend who was the other in-house paralegal in my department and friends around the office, but I was missing the connection of a larger paralegal community. I also wanted more opportunities for advancement in my professional life. I started volunteering with company-sponsored events and decided to apply for a company-wide leadership development program. The program was a great opportunity for professional development. I reached out to a few people I knew in the program and they encouraged me to apply noting that I would be an excellent candidate. I was looking forward to being apart of this group of future leaders. But, unfortunately, I was rejected from the program. Despite my ambitions and qualifications, I didn’t have the one thing necessary to put me over the top – a champion to support my nomination. Needless to say, I was devastated. The one positive outcome was learning that I needed to be my own champion and find my own leadership opportunities. (P.S. I’m still working on that to this day.) I had been a member of the Paralegal Division for a few years, mostly for the CPE hours and the quarterly newsletter. In 2012 everything changed for me when I submitted my nomination for a council member position. I was grateful for the guidance of then-Chair Karen Mendorf, who took time to meet with me and answer questions. Karen offered me the opportunity to volunteer with the Student Relations Committee and help with a career fair later that spring. I was also selected to serve as a council member that same year. I was excited and grateful to be accepted; this feeling of acceptance is something I strive very hard to instill in the council. I still remember my first council meeting and strategic planning session. I was surrounded by a room full of amazing paralegals. It was the community I had lost and found again. It was and still is great to feel connected and be a part of a collective group of amazing paralegal professionals. I spent the next few years serving as a council member, co-chair and chair of the Student Relations Committee, then co-chair and chair of Newsletter/Blog Committee. I have spent hours attending council meetings, talking to local paralegal schools, organizing a career fair (getting volunteers, sponsors, exhibitors, etc), putting together the quarterly newsletter and mapping out and planning content for each article, working with NCBA Staff to move from a quarterly newsletter to the blog and becoming more involved with the blog (where content needs to be more timely), researching the history of the division to compile a PowerPoint presentation to celebrate the division’s 15th anniversary, organizing a CPE, taking meeting minutes while serving as division secretary, among other phone calls, meetings and emails from 2012 thru 2018. My journey to date has had its ups and downs. However, the biggest reward for me has been my increasing network of friends, colleagues that I can lean on and learn from, and the general camaraderie among paralegal professionals that has inspired me to reach my goals. It has been an invaluable experience to date! I’m so grateful I took that first step. I encourage you to take inventory of your talents and skills and consider supporting the division in a leadership capacity. The Paralegal Division Council provides leadership, general supervision and control of the division’s affairs. The council reviews the budget, discusses funding for various division activities, scholarships and benefits, helps advise committee chairs on projects, as needed, among other various items. The council helps shape the direction and agenda for each bar year. Over the last year, I’ve enjoyed watching my fellow council members take ownership of projects, and committees, provide invaluable insight on division matters, advocate for the citizens of North Carolina and keep the interest of division’s members front and center. If you are looking for an opportunity to develop professionally, reconnect with colleagues, make new connections, or be more involved, the nominations period is now open through Feb. 28. I hope you’ll consider applying (find the nomination form here) or reach out to me if you have questions.